Ford is making a few changes to make the new Ford F-150 SVT Raptor an even more capable high-speed performance truck. Among the most significant pieces of engineering in the new Raptor is that a locking differential will be available for the independent front suspension. Last year’s Raptor had an open front differential and locking rear. For 2012, Raptors will continue to be offered with the electrically actuated rear locking differential, but now a traction-tuned front Torsen differential will be offered, too. A Torsen differential is a set of cams (as opposed to plates) that will ramp up on one another, causing full differential lockup when the truck senses a certain amount of slip between the right and left tires. The system increases grip significantly for the front end of the truck and allows the vehicle to pull itself over obstacles and up steep grades even when the traction is split between the front tires. Also, Ford is now equipping all SVT Raptors with a front camera option to allow drivers to see what’s happening directly in front of each tire. The system can be used like an extra spotter if the driver decides to challenge tough terrain alone. The camera can be activated only below a certain speed and when the vehicle is in low range. The view is displayed on an 8-inch screen in the center stack. The camera is mounted in the grille and includes a dedicated washer function that is activated by pressing a lever on the left steering-column stalk. Finally, all 2012 Raptors will have a series of interior and exterior styling changes to help further separate it from 2011 models. Exterior changes include a new Raptor logo and a graphics package based around two diagonal stripes with jagged lines and shapes. Inside, a new matte Anodized Blue interior color accent will replace the existing color. The new package includes accent leather-trimmed front seats with unique leather inserts and accents on the center stack, rear seat inserts and door panels. Aluminum trim accents are also used on the instrument panel and center console. Also new for 2012 is the addition of cooled seats to the optional Luxury Package and a new Euroflange wheel with balancing weights on the inside to better protect from off-road debris and obstacles. The 2012 Raptors, in both SuperCab and SuperCrew cab configurations (the latter of which has an 80-percent take rate), will continue to use the 411-horsepower, 6.2-liter V-8 and run 35-inch BFGoodrich all-terrain tires. The new Raptors are expected to arrive at the end of November. More pictures are below. It's odd there's no mention of an update to the infamous designed-in frame failure mode. By all accounts it would be a simple mod. Does it still have that dinosaur 6.2L engine ? Front limited slip and rear locker?.....I want that in my regular F150! How is the 6.2L a dinosaur? It's a brand new engine. If anything, with it's iron block and high mounted alternator, it's a perfect engine for an off-road vehicle. The best gets better. But, the best wasn't perfect. Did Ford reinforce the frame above the rear axle? Might want to look into that. Done alot of research on this huh? Fact is, they do have a mod to protect the frame, and it conveniently fits right behind the steering wheel. It's heavy, very, very thirsty and doesn't have enough power. ^^^ because we were the first to know all of this what, 6 weeks ago? thanks for the "breaking news" though. We have a washer for the camera.... now can we get one for the headlights already? Big, heavy, useless... and most of them will probably never be used off-road anyways. The Raptor is going to get terrible mileage regardless of what engine you put in it. It's wider than a typical half-ton, it has 4.10's, and it has nearly 35" tires. As far as not having enough power....how much more do you want? It's the most powerful truck engine currently being produced at 411hp and 434ft-lbs tq. That's almost 100hp more than the 5.4L they were using originally. Where do I sign? This is the news, about the Ford F-150 S.V.T. Raptor, that I have anxiously been waiting for. Aside from a solid-front axle. Woo-hoo!!! Ford, please continue to make the S.V.T. Raptor for at least a couple more years. I should be ready to buy by the 2013 model year. My Power Wagon will finally be paid off next month. Thank you Ford for listening. The Best Never Rest!!! @Powercell -- The photo is of the rear locking differential. We're trying to get a cutaway of the front one and a better variety of current model. Should be able to get more at the show. Fact is, Ford is the king of misrepresenting products while taking anyone's $ for a quick sale. Stick to the greasy, knuckle busting side of the vehicle. I can not wait for the; Four Wheeler- Pickup Truck Of The Year and the Petersen's 4Wheel & Off-Road- 4x4 Of The Year issues. The 2012 Ram 2500 Power Wagon (new transmission) and the 2012 Ford F-150 S.V.T. 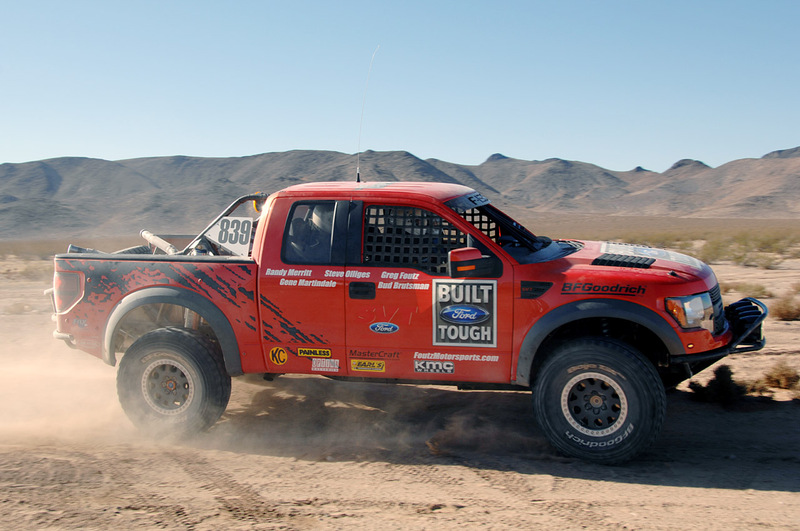 Raptor (new locking-front differential) should both qualify for the competitions. They are both winners in my book. The only two pickups (compact, mid-size, or full-size), and American to boot, that have true 4x4 (rear and front lockers) capability! Amazing truck!!!!!! Good job Ford! Nice to see if the Raptor gets better than the 40th place and a class win in this years Dakar. Maybe the Global Ranger could be entered? VW has withdrawn, so the fight for outright honours becomes interesting. On an IFS -equipped vehicle, I'd be careful with front lockers! Locking up the front on rocks let say puts greater pressure on those axle shafts! I would rather have the front free and not binding under pressure when locked! Kind of funny that they are bragging about an e-locker here in 2011 when Toyota debuted the Tacoma in 1995 with one! If fuel mileage is you're main concern you shouldn't even be looking at a pickup...Much less a Raptor. And like Paul810 already said...How much power do you want? 411hp isn't enough for you? I guess you have never driven any select 1/2 ton from Ford/GM or Dodge that was made in the 1980s and struggled to produce 150hp and STILL go worse mileage than this 411hp Raptor. The goverment should replace the Humvee with the Tacoma. The Tacoma is the only truck worthy to compete in SCORE and Baja. If there is a god and he drove a truck it would be a Tacoma. The Tacoma could crash into a brickwall at 150mph and come out with only a scratch in the paint. Walker Texas Ranger should have traded his Dodge Ram in on a Tacoma. ...Oh I'm sorry...pardon my immaturity. I just can't help myself sometimes when you comment Oxi. If I'm not mistaken, isn't a Torsen diff based on the "friction" of helical gears instead of the locking action of plates, cones, or cams of other limited slip diffs? "Additional capability for the 2012 F-150 SVT Raptor comes from a new Torsen front differential. The system increases grip significantly for the front end of the truck and allows it to pull itself over obstacles and up steep grades, even when the traction is split between the front tires. Special modifications were made for the differential's use on F-150 SVT Raptor, with a redesigned case created specifically for the truck's high-torque application." He's got a point there, Oxi...I mean, I'm a former Tacoma owner (and huge fan) but your comments are so narrow-minded you should really change your screen name to Buy Toyota or Say Bob to Michigan. They should put you, Michigan Bob, and Crazy Buy American Guy on a desert island together and not let you leave until you've all agreed on which is the best truck. You'd all surely starve there, but at least it'd rid this blog of your ridiculous comments. The truth of it: Each and every truck can be described in terms of a series of compromises and trade-offs. Humans made these things...ain't a one of 'em that couldn't stand improvement. They're all junk. Everything breaks. Even Tacomas. @Alton: Ford isn't innovative? Dodge has finally come out with a do-it-yourself Raptor wannabe kit, and GM has nothing even approaching the Raptor. And no comes close to Ford's stability control, off-road modes, hill descent control, or integrated electronics. @ziviera: Not enough power? Hauls a 6400 pound truck to 60 in 6.2 seconds. That's better than a not-really-a-Hemi, or anything GM makes. Wow! I'm impressed. My old '84 Ranger came with a factory front limited slip and it made all the difference in the world. I never imagined Ford would actually use one again. Not to mention, for anyone who's ever crawled off-road, that front camera is worth more than big tires and a monster engine. I wonder if they're going to beef up the frames to stop them from bending? The Hemi CrewCabs are 6.4 0-60 the QuadCabs are around 6.0 - 6.2 as they are lighter than a crew cab,better yet a single cab !! Jealous people say the Hemi isnt a real Hemi,because you Ford,GM,Toyota people are ticked off because in Top Fuel racing your Ford,GM,Toyota has a Chrysler HEMI in it !!!! Ford ...ect... stamped on the valve cover buts its a Mopar engine ,based on the 426 hemi,original 1960's Chrysler parts bolt up to the top fuel Hemi ,as we build one recently. Worrying about mileage in a toy like this is stupid. The real appeal of the turbo six motor is it would take about 250 pounds off of the front axle. Would you come visit me on the deserted island. You could help keep me warm. We could turn it into a conjugal visit. I will whisper sweet Fords and Rams & Toyota nothings in your ear. "On an IFS -equipped vehicle, I'd be careful with front lockers! Is it true? Has oxi seen the light about one of the inherent weaknesses of an I.F.S. system and the superior strengths of an S.F.A.? There is hope yet. Front LSD- no we're cooking with gas! Does the raptor not have an axle disconnect? I'd like to see how they made it work. What front dif is in the F150/Raptor now? @Paul810- hells yeah! As long as the regular trucks use the same front diff, that should definitely be an option for any 4x4, along with perhaps, the same diff for the rear. @zviera- elavorate please. A torsen is within a pound or two of a regular diff and shouldn't use any more fuel. With the smallest motor having 300hp, I don't think you can call any new F150 underpowered. @Ken- not sure if you're a troll, or just a tool. @oxi- its an LSD, not a locker. It should be fine, especially if Ford did an expectedly good job of dialing down torque while in low range. The problem is the mounting locations of the Fox shocks. Below the axle and both canted forward causes axle wrap/rotation, landing the bumpstops off center and striking the frame directly. See the damage here. Pro Raptor Rs aren't experiencing bent frames but look at how the shocks relate to the axle. Dead center over the axle and perpendicular to the leafs. That wouldn't be possible on production trucks without the shocks protruding into the bed but another solution would be a 4 link system like what's on the RAM as an add on. Or one center link above the pumpkin. How about staggering the shocks? One forward and one to the rear. That'd be the simplest route. You know, I always kinda suspected all that macho posturing HAD to be compensating for SOMETHING, but sorry dude...I just don't swing that way. LOL! Out of curiosity, does the Torsen work in conjunction with the truck's brake/modulating traction control system for low speed crawling? I know with Torsen differentials, you need to have resistance on both wheels to get the torque transference. If one wheel is spinning free up in the air (like you might see in rock crawling) it will function as an open differential. It would need brake modulation to function like a locker. @ paul810 - In some respects the 6.2 is a dinosaur. It is an old school "true" big block engine (not a large displacement small bolck AKA Chevy 6.2) I am surprised that Ford didn't go with DOHC. The SOHC component of it is a tad dinosaurish but not as much as a pushrod engine. @Mopar Guru - the whole Top Fuel argument is as lame as it gets. The rules state that a "hemi like" engine is all you can use. That is no different than NASCAR rules saying that all you can use is a carbureted, pushrod, small block V8. At least NASCAR is going to allow some change and go to Fuel injection. That is like saying Harley Davidson makes the best drag bike, but you only allow Harley's to race ie, AHDRA. @Jason H - I must admit - that was a funny post. - Who gets voted off first? - or first man holding their ankles? The 6.2L is not a big block. I have no idea where you heard that. It's a tall deck small block, just like Ford's 5.4L and 351w engines were. As far as SOHC and iron block, they went with that for one simple reason: cost. The 6.2L is also shared with the Super Duty in the highly competitive HD pickup market. They could make a high-feature version of the 6.2L (aluminum block, 4v, DOHC), but it would be excessively expensive and, more than likely, less durable. With that said, the 6.2L is in it's infancy. Ford has said they can do a lot more to it if the need arises. It's capable of being enlarged to 7 liters, it capable of handling DOHC 4v heads, it's capable of handling forced induction, and so on. They've made versions of that engine that put out over 800hp on e85. @paul810 - I read several places refer to it as a "big block". I'll have to do some homework. I thought it was more like a Cleveland block than like a Windsor block? Rats! You had me from, hello. Ha-ha! Here is a great write up un the 6.2. It sounds like a "big block" to me. Ford made many engines that were called "big blocks" but in many respects, split the difference between a small and big block design. Perhaps that is where the 6.2 slots in. The Cleveland, and Ford's FE series were regarded by some experts as "mid sized blocks". That seems to be a more new reference, as I grew up with just big or small block designations. I will withdraw the "dinosaur" label as it IS a new engine, and meets its designed application goals quite well. @Buy American Or Say Bye To America! Straight axles are a thing of the past, just ask the U.S. military! Straight axles locked in the front break likewise! New suspension needed or reduce the weight of the truck, problem solved! I have driven a Raptor with 5.4. My friend still has one. power than my HEMI in Durango. I was expecting close 500Hp from 6.2 L Raptor with fixed frame problem, 6.4 Hemi and full time AWD would be my choice. So no trolling , just summarizing a facts. @Mrknowitall 6.4 HEMI with MDS was launched with 475 horsepower and 460 lb-ft of torque. Summary: so yes, there are better engines with more power and less gas consumption on the market than this 6.2 prehistoric one. The suspension design is standard issue and not necessarily flawed. No different than what's on Tacos but no other factory stock trucks have been pushed as far or as often. Adding Fox shocks and not redesigning the suspension specifically for them or the additional punishment owners would put Raptors thru is the problem. The Raptor is one heavy truck but much heavier than the FX4 crew cab. Or Tundra crew cab for that matter. The Raptor may be too big for your needs especially if you're a little guy, but its suspension is more than apt for its size/weight. Just needs some tweeking so the frame doesn't. Either way, there's no way I'd feel safe in a trying to keep up to a Raptor thru the desert @ 100 MPH in a stock Taco... Not even the new Taco TRD T/X Baja!